This cartoon grew out of our astonishment that, particularly in the context of childbirth, U.S. law seemed to most strongly approve the right to refuse care when the refusal was based on irrational grounds. Evidence-based refusals both in law and in fact seemed to meet with much stronger resistance. The provider explains the suggested treatment or procedure. The explanation sets forth the risks and benefits of the treatment as well as the risks and benefits of any alternatives, including doing nothing. The provider must ensure the patient understands what they have been told. The patient makes a decision based on the information received, as well as on their own values and circumstances. Although informed consent requirements are now incorporated into patients’ rights acts in some states, informed consent doctrine has traditionally evolved as interpreted through a line of court cases, as shown in this cartoon in dark red text. Schloendorff v. Soc’y of NY Hosp., 105 N.E. 92 (N.Y. 1914). Patients who do not consent to treatment that is carried out on their bodies can sue the provider for battery, with exceptions for emergencies and unconscious patients. Canterbury v. Spence, 464 F.2d 772 (D.C. Cir. 1972). Physicians bear a responsibility to explain the risks of a procedure to the patient before proceeding with treatment. In re Quinlan, 70 N.J. 10, 355 A.2d 647 (NJ 1976). Patients may refuse care, even if not receiving the care might result in their death. Stamford Hosp. v. Vega, 236 Conn. 646 (1996). The court ruled that the hospital had violated the rights of the plaintiff, a Jehovah’s Witness who refused a blood transfusion. The hospital had obtained a court order that allowed it to administer transfusions or blood products to the plaintiff for a postpartum hemorrhage. This case supports the right of a mother to refuse care, notwithstanding the contention that the loss of the mother would cause harm to the child. McFall v. Shimp, 10 Pa. D. & C. 3d 90 (July 26, 1978). A person cannot be forced to donate body tissue (here, bone marrow), even if not to do so would cause death in the person needing the donation, and even if the potential donor is a close relative (here, a first cousin). Tamesha Means v. United State Conference of Catholic Bishops (appeal in progress). Tamesha Means, a Michigan woman experiencing a miscarriage at 18 weeks, was denied care at a Catholic hospital because her fetus still had a heartbeat. The hospital’s actions were a result of a directive of the U.S. Conference of Catholic Bishops that prohibits abortion under all circumstances. Rather than intervening when Means developed an infection, the hospital turned her away without disclosing that the refusal to treat her was based in religious belief rather than in the standard of care. The case was dismissed at the trial court, but Means appealed to the Sixth Circuit Court of Appeals, where it now awaits a decision. Some provisions in state statute allow providers to refuse to offer care and require that parents accept care for their minor children. Provider “Conscience Clause” statutes. Many states have enacted legislation to permit various health care providers to file a professional, ethical, moral, or religious objection to any procedure without any consequences for the individual provider or institution. Michigan’s law, Mich. Comp. Laws §§ 20182-4 concern abortion, but other states have enacted broader provisions for refusing to provide other services, such as filling contraceptive prescriptions. Required newborn procedures. State public health code usually specifies mandated procedures to be performed on newborns. As a rule, the parents have the right to opt out of most or all procedures. In Michigan, for example, only newborn screening and prophylactic eyedrops are mandated by statute. The legal duty to perform the procedures tends to attach to the provider, which is perhaps why parents are discouraged from opting out, often to the extent of simply being told, “it’s the law” that their child receive these procedures. Other procedures, such as Vitamin K and Hepatitis B vaccine administration, are also often characterized by providers as being legally required. Enforcement varies by state; New York is usually held out as the strictest state in requiring parents to accept the procedures for their child. Regardless, parents are increasingly sharing anecdotes of being threatened with reporting to Child Protective Services if they refuse this care. Frame 1. The building in the background is, of course, the U.S. Supreme Court building. Frame 2. Count Dracula is refusing a transfusion because he is a practicing Jehovah’s Witness, as signified by the copy of The Watchtower tucked under his arm. Frame 3. Parents do have to put their foot down on serious matters like broken legs and Sunday School attendance. Parents are empowered by law to make medical decisions for their minor children. Children cannot give informed consent, although they are – ideally – consulted to see whether they assent to care. Little Jimmy apparently does not. Frame 4. Thanksgiving dinner, when the family is all present and dismantling a large bird, seems the ideal time to talk about donating body parts. It’s either that or politics, right? Frame 5. The nurse in this illustration is invoking a conscience clause right to refuse to assist with an abortion. If the refusal seems sudden, that is because state law does not require providers to register their refusal at any given time – or indeed, forbid them from changing their stance at any time. Frame 6. Tamesha Means’s less than forthright provider (see Tamesha Means v. United State Conference of Catholic Bishops, above) did not inform her that she was suffering from an infection that could ultimately prove life-threatening. Means was fortunate not to be permanently injured, unlike a case in Ireland that ended tragically. See the story of Savita Halappanavar. Frame 7. Many providers believe that a signed informed consent form of the kind that is often required when a patient is admitted to a maternity care unit constitutes a contract that cannot be changed. Nothing could be farther from the truth. Consent can be revoked vocally at any time. Frame 8. The topic of who decides for the fetus is a rich one – and much too complex to include in this cartoon. Move along now! Frame 9. Medical malpractice liability is often held up as an excuse for ignoring informed consent requirements – or as an opportunity to blame lawyers. (Health care providers tend to forget that lawyers defend them too!) This frame seeks to make the point that there is no corresponding liability avoidance right for the provider that would trump the patient’s right to refuse care. Frame 10. Continuous electronic fetal monitoring (EFM) for all pregnancies is the standard of care in the United States, even though it has not been shown to improve outcomes in low-risk pregnancies. (It does reduce the number of seizures suffered by newborns, but not to the extent that final outcomes are affected.) Furthermore, EFM has been shown to lead to an increase in cesarean sections. Maternity care patients in particular have been heard to remark with surprise that they seem to be responsible for upholding their right to consented-to care that is also evidence-based. One would think that it would be the provider’s responsibility to offer this care, but … blame the lawyers! In truth, the provider’s hands often are tied – usually by their own institution’s policies or their malpractice liability insurer’s rates. Frame 11. See Required newborn procedures, above. The mother in this frame is musing on the likelihood of her one-day-old baby being exposed to Hep B by sharing needles with a cribmate. Frame 12. If you have not yet become acquainted with the Church of the Flying Spaghetti Monster, you can remedy that omission here. Perhaps the strategy suggested in this frame is inadvisable, since a Nebraska Federal District Court declined to recognize FSM as a religion. 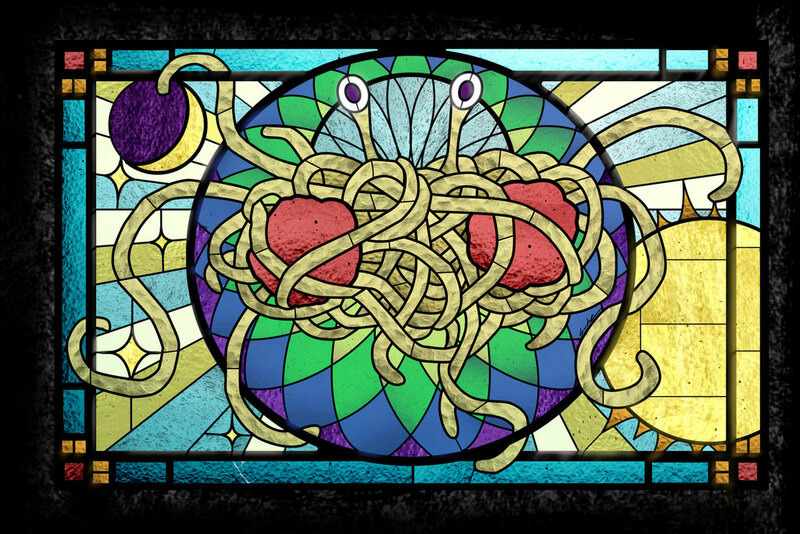 You can find a lovely stained glass panel representing the FSM here. The story behind an adherent of FSM (a “Pastafarian”) and her successful struggle to be permitted to wear her religious head covering in a state ID photo is documented here. Categories: law, maternity care | Tags: cartoons, civil justice/tort system, informed consent, insurance, medical malpractice liability, Michigan law | Permalink.